Greenpeace activists hold pictures of the detained 'Arctic 30' activists as they demonstrate in Moscow, on October 18, 2013. 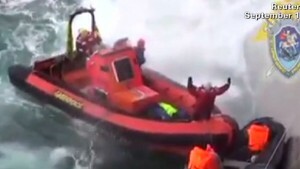 Greenpeace says charge still "wildly disproportionate"
(CNN) -- Russia has dropped charges of piracy against 30 Greenpeace activists who were arrested during a protest against Arctic drilling in September. However, they'll still be charged with hooliganism, which carries a sentence of up to seven years in prison, according to Russian news agency RIA Novosti. The original charge of piracy carried a sentence of up to 15 years. Greenpeace says the hooliganism charge is still "wildly disproportionate." "We will contest the trumped up charge of hooliganism as strongly as we contested the piracy allegations. They are both fantasy charges that bear no relation to reality," Vladimir Chuprov of Greenpeace Russia said in a statement. 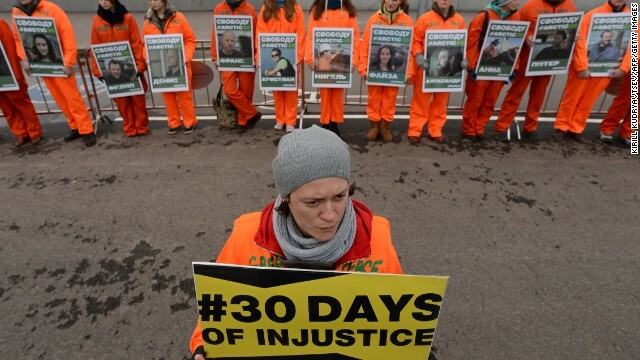 The so-called "Arctic 30" includes 28 activists and two freelance journalists. They were arrested in September after two activists left their ship, the Arctic Sunrise, and attempted to scale an oil platform owned by Russian energy company Gazprom in the Barents Sea. The Russian coast guard detained the pair and the rest of the crew, and towed the ship to the northwestern Russian port city of Murmansk. "Those brave men and women went to the Arctic armed with nothing more than a desire to shine a light on a reckless business. They should be with their families, not in a prison in Murmansk," Chuprov added. Greenpeace said the two activists were trying to hang a banner from the side of the rig in what the group called a peaceful protest against the "slow but unrelenting destruction of the Arctic." But Russian authorities accuse them of trying to commandeer the platform. The authorities and Gazprom also say the activists endangered the lives of the company's employees and that their action could have led to an environmental disaster. Along with the hooliganism charges, the chief of Russia's Investigative Committee, Vladimir Markin, said some members of the group could also be charged with using force against state officials, according to RIA Novosti. 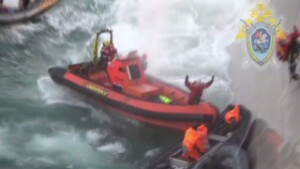 The defendants include Americans Peter Wilcox, who is the captain of the Arctic Sunrise, and Dmitry Litvinov, who Greenpeace says also holds Swedish citizenship. The other detainees are from Argentina, Australia, Brazil, Canada, Denmark, Britain, New Zealand, Ukraine, Russia, France, Italy, Turkey, Finland, Switzerland, Poland, the United States and Sweden, the group said.